Keywords are extrapolations of numerous search queries. They consider misspellings, misplaced words, and other errors in forming an aggregate representation of a common query. Keyword data is easily researched on Google Keyword Planner, SEMRush, and Moz Keyword Explorer, while search query data is exclusive to Google Search Console, and is even somewhat limited on there. 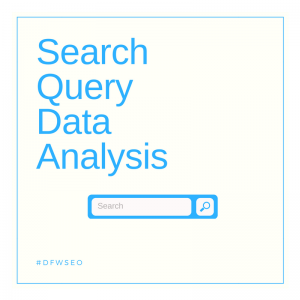 For search query data analysis services in Dallas – Fort Worth, TX, call us today at 800.231.4871. From a business standpoint, search analytics reports are invaluable. Any time you can acquire insights about your audience and their behavior, you can improve your marketing strategy in some context. It’s important to understand that while Google Search Console provides search query data, it does not include every single query that has lead to your website. Still, the information it does reveal, can make a major difference in your marketing campaign. Our intention in generating and analyzing query data is to improve your company’s marketing efforts. We can accomplish this through content marketing and keyword placement. If users are reaching your website when searching for “roofing company near me” we can implement that into your content marketing strategy. Alternatively, if your website is appearing for a particular query, but not garnering clicks, we can eliminate that query, and its relative subject matter, from your content. There are several places to implement queries within you website. Titles, headers, paragraphs, and meta descriptions can all be improved based on query data. As the #1 SEO company in Dallas – Fort Worth, TX, we are constantly evaluating the latest internet marketing trends, keeping our clients ahead of the curve, and embracing the fluidity of a constantly evolving industry. In addition to reporting and analysis, we offer website design, SEO, PPC, and much more. Call us at 800.231.4871 and ask about search query data analysis. Updated on April 12, 2018 at 7:52 pm by Dallas / Fort Worth SEO.